CPLA Lighting 3D Moon Lamp Review BackyardToolshed - All your tool needs in one place! A home feels a bit incomplete without a good quality lamp. It’s a great way to be an ample source of light during the night, a nice bedside light for reading, and so on. Lamps can even be more than just for personal use, because it works great as a nice gift for anyone being that it’s such a universal product. But a simple night light bulb surely doesn’t say you care enough. It’s a boring a bulb that you plug into your wall socket and that’s it. That kind of night light is quite forgettable. Nowadays, everyone wants something trendy and trending. Trendy is something fashionable, but trending items are not always good looking. And yet there’s something about trending products that everyone goes out of their way to get their hands on it. If you want to be a part of the hipster people and want what’s all things trending today, then look no further than moon lamps. The CPLA Lighting 3D moon lamp is an LED moon lamp that has amazing features and an even more amazing appearance. CPLA was able to produce a realistic moon lamp through the most advanced 3D printing technology. 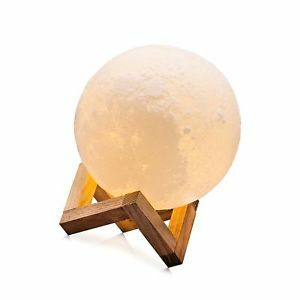 The authenticity of this particular moon lamp is so stunning that it feels like you have a moon made just for you. With a CPLA 3D moon lamp purchase, you get a USB cable for charging, a wooden mount for display, and a user’s instruction. The time it takes to charge this moon lamp is about 3 hours, and with that you can use it for up to 20 hours. As always, it’s case to case basis depending on how often you use its features and how much brightness you set it to. Although if you think that this is something that would be an issue, don’t panic just yet. The CPLA moon lamp can be used while it’s charging. When it comes to using this moon lamp’s function, it’s easy and convenient to use. It’s designed with touch control which you can activate by turning on the switch button. Once you turn that on, you can enjoy playing with its amazing features. A short touch on the moon lamp will allow you to switch color modes. One tap will turn your moon on cool white mode and two taps will change it to warm yellow mode. To turn it off completely, just tap again. While it’s on, at any color setting, a long touch on the moon lamp will allow you to adjust its brightness. Adjust color and brightness settings in a dark room for optimal accuracy. Keep your moon lamp away from temperatures above 50-degrees Celsius. Make sure to keep your moon lamp clean and away from any grease or liquid. Be careful in handling your moon lamp to avoid any sudden drops. If unsatisfied or there are any other issues with the moon lamp, a 100% refund can be arranged withing 90 days of purchase.